HOT TERMIPol® DNA Polymerase is a thermostable DNA polymerase suited for MALDI-TOF mass spectrometry and other primer extension platforms. The enzyme has 5’→3’ polymerase activity and enhanced efficiency for incorporating unconventional nucleotides (ddNTPs and labeled ddNTPs). 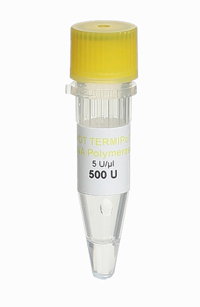 HOT TERMIPol® DNA polymerase is a chemically modified TERMIPol® DNA polymerase. At ambient temperatures it is inactive, having no polymerase activity. HOT TERMIPol® DNA polymerase is fully activated by a 8-12 minute incubation at 95ºC. This prevents extension of non-specifically annealed primers. 01-06-00500 500 U 5 U/μl PDF PDF PDF 60 EUR Login to buy! Shipping and temporary storage for up to 1 month at room temperature has no detrimental effects on the quality of HOT TERMIPol® DNA polymerase.